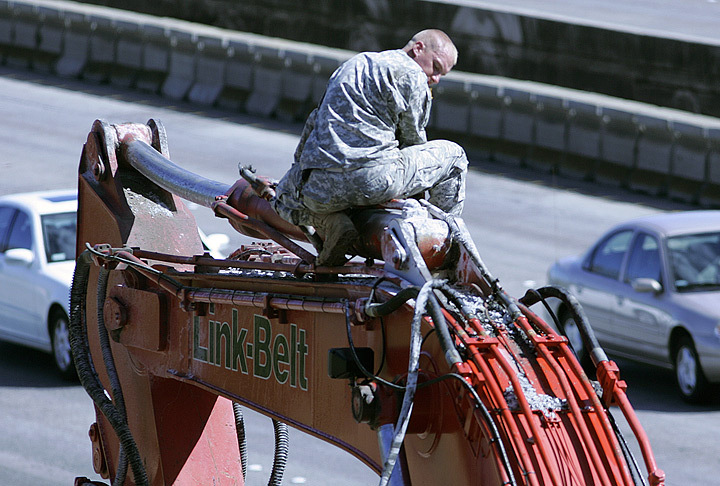 Work at the site of a bizarre accident that reduced westbound H-1 freeway traffic to a crawl yesterday will affect eastbound freeway traffic today as crews work to demolish a damaged Aiea overpass. Eastbound commuters will have five instead of six lanes through Pearl City because the Zipper Lane will not be activated. State officials could not predict last night whether the westbound lanes would be reopened in time for afternoon commuters today. 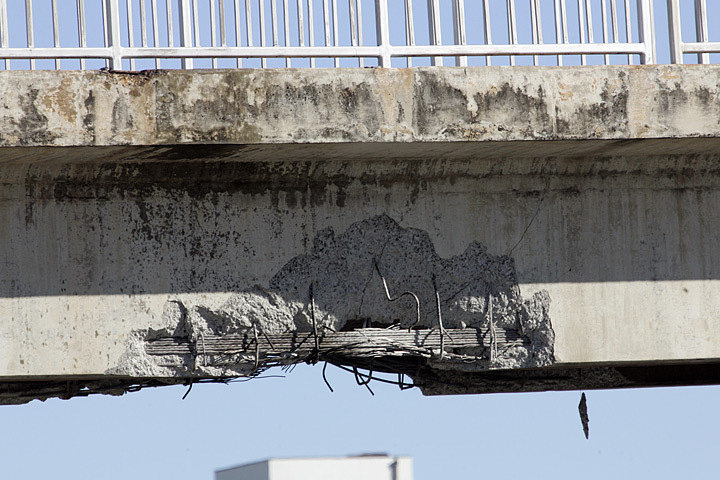 State officials decided that it would be unsafe to allow the overpass to remain because the vertical support beam was damaged so severely in the 1:30 p.m. crash by a military vehicle. Motorists were stuck in stalled traffic for hours as westbound vehicles were diverted from Moanalua Freeway and the H-1 near Halawa. Mililani resident Rob Green said people left their cars and walked on the freeway as traffic froze in a gridlock on the H-1 viaduct passing Honolulu Airport. 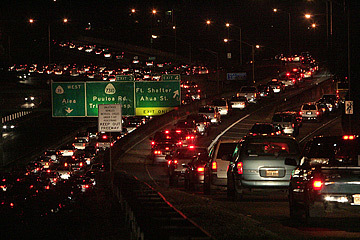 "I saw people walking across the Zipper Lane to get to Koko Head-bound lanes," Green said. Green boarded TheBus in Honolulu heading home to Mililani at 4:05 p.m. and reported arriving there just before 9 p.m. He said the bus driver made a merciful pit stop when they finally reached Aiea after four hours on the H-1 viaduct. Most of the people on the packed bus went into the bushes in a grassy area near the Navy Personnel Support facility to relieve themselves. "The people on the bus, we're all old friends now," said Green. "Several of us finished our books. It's good to get home." 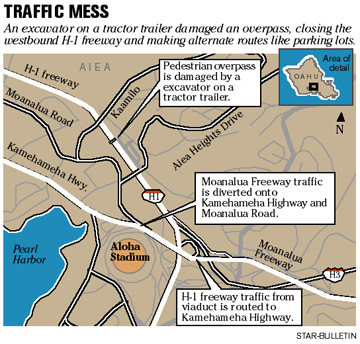 Motorists were channeled on a three-mile detour through Aiea on Kamehameha Highway and Moanalua Road before returning to the H-1 at Waiau onramp. Police said the traffic backlog extended into town and continued late into the night. Hawaiian Dredging Construction Co. crews worked overnight to bring down the mauka portion of the pedestrian overpass near Kaamilo Road. State Department of Transportation spokesman Scott Ishikawa said engineers today will assess whether the makai portion over eastbound lanes will need to be brought down, too. It is a separate structure from the portion spanning six westbound lanes, he said. The structure was severely damaged when it was struck by a hydraulic excavator being carried aboard a military truck. 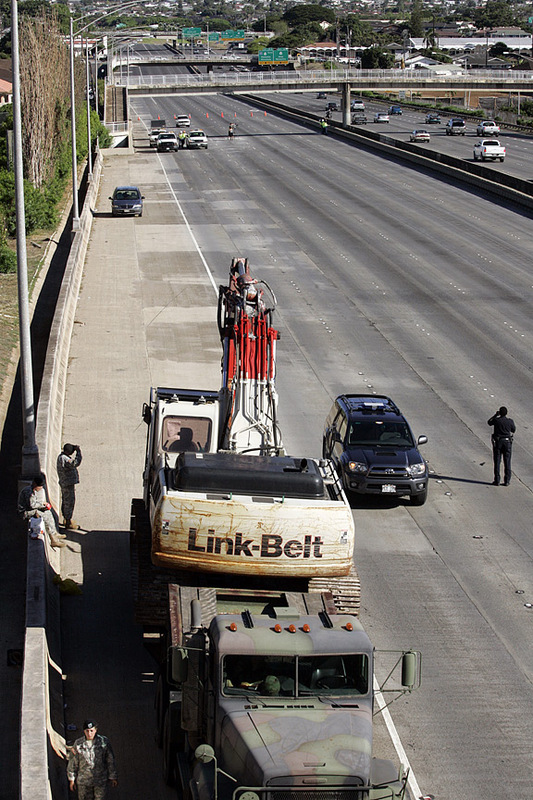 The excavator rode so high that it did not clear the 16-foot, 9-inch height. 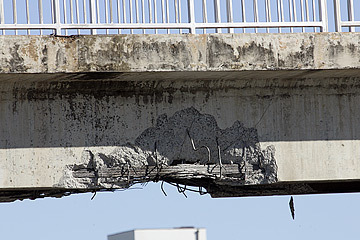 "Not only the concrete was damaged, but some strands of cable within the concrete were snapped," Ishikawa said. "The cable is the strength of the structure." The overpass carried traffic from Olopana Street near Aiea High School. Police and the Army are investigating the circumstances of the crash. A Schofield Barracks spokesman said last night that it was an Army vehicle but officials had not determined whether it was from the 25th Infantry Division, the Hawaii National Guard or some other unit. A Pearl City police spokes-woman said uniformed officers were called in early and plainclothes officers were assigned to help keep traffic moving through intersections on Kamehameha Highway and Moanalua Road.